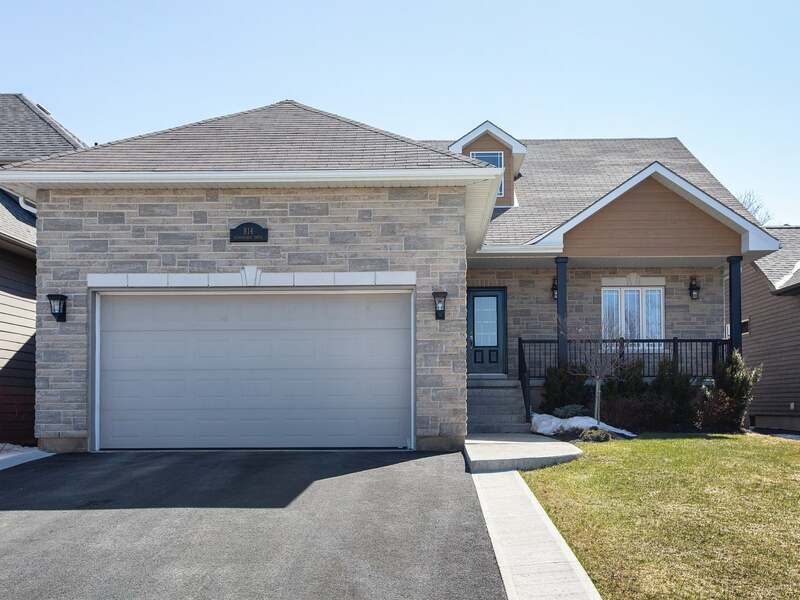 Spacious 1,700 sq/ft 3 bedroom, 3 bath bungalow in Westbrook Meadows! Featuring stone exterior, inviting front porch and large tile foyer. Open concept floor plan offering gorgeous living room with maple hardwood and gas fireplace with stone surround overlooking the kitchen with granite counters, tile backsplash, large island w/extended breakfast bar, walk-in pantry and dining room with patio doors to large two-tiered deck w/gazebo. 3 spacious bedrooms including master with walk-in closet and ensuite with angled jet tub, separate shower and large granite vanity. Fully finished lower level with massive rec room with laminate flooring, den & office both w/window and closet, exercise room and 3-piece bathroom w/custom tile & glass shower. All this plus 9ft main floor ceilings, central air, HRV, double garage with opener and nicely landscaped front and back. A must see home just steps to park and walking trail and minutes to all west end amenities. Lot Size 50 x 118 Sq. Ft.